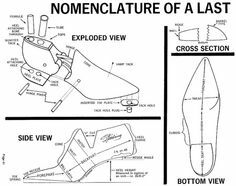 A shoe’s shape is determined by the mold or “last” that is used to build the shoe. Imagine a shoe stuffed tight with clay. The shape of the clay would be the shape of the last. Shoe manufacturers, unfortunately, tend to use a standard “last”. The front or “forefoot” of the shoe is proportional to the heel in width. The front is wider, but not a lot wider. For millions of people this is bad news. Many people need a disproportionately wider forefoot or a disproportionately narrow heel or a deeper “toe box” than the standard “last” offers. These are very hard to find. One company that has taken this dimension of shoe sizing and manufacturing to heart is New Balance. Below is a chart (from 2012, so it may have evolved) that gives the “LAST TYPE” codes for each of the different fit combinations. Use these codes when you shop for New Balance shoes.